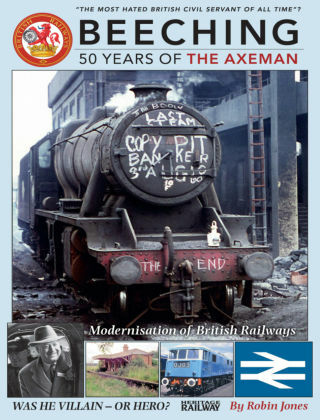 With Readly you can read Beeching - 50 Years of the Axeman and thousands of other magazines on your tablet and smartphone. Get access to all with just one subscription. New releases and back issues – all included. Described as the most hated civil servant in Britain, it was half a century ago that Dr Richard Beeching was appointed as chairman of British Railways with one key directive - to cut the soaring losses. The 1950s had seen the start of a mass shift from public to private transport, as lorries, cars, buses and motorbikes replaced trains as Britain’s most popular means of travel. So often pilloried by the press and public for closing numerous picturesque and romantic country branch lines, leaving even many large towns cut off from the railway network, Beeching might also be seen as merely streamlining a process that was already underway. Back in the early Sixties, there were many who thought that not only were the days of steam locomotives numbered, but those of railways too, as mankind, leaping towards the first lunar landings, looked toward hovercraft and hovertrains as the transport of the future. Against the dynamic background of the greatest decade of change of the 20th century, Heritage Railway editor Robin Jones looks back at the forces that were shaping the railway’s fortunes, the Beeching Axe, its critics, aftermath and its repercussions today. Was Dr Beeching the villain of popular legend - or was he a hero who made Britain’s railways into a slimmer, leaner machine far more capable of tackling the challenges of the future? You decide!